No superstar in history has made more of an immediate impact than Kane. On October 5, 1997, the world met Kane, as the seven-foot monster tore off the door to "Hell in the Cell" in order to get to his brother, the Undertaker. The siblings later fought in the first-ever Inferno Match! Less than one year after he arrived, Kane became the World Wrestling Entertainment Champion by defeating Stone Cold Steve Austin at the 1998 King of the Ring. Though his reign was short-lived, the seven-foot monster proved he could live up to all expectations. 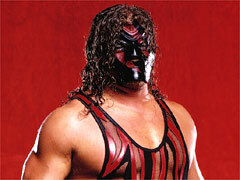 Since then, Kane has been a Tag Team Champion on six occasions. Once a man of no emotion, Kane has somewhat broken out of his shell. However, the 7-footer still remains a monster in the ring.